It doesn’t matter whether it is part of your job or not, but once you get involved in activities that concern electrical installation, repair and maintenance you will need to get quality lineman pliers for this kind of tasks. There are various types of lineman pliers, and each type is used for specific purposes. It is, therefore, important that you know which type is best suited for your line of work and why. Keep reading this article to learn how to choose the best of this tool and reviews of the top best pliers in the market. There is a significant difference between lineman pliers and traditional pliers. While you might find it easier to grab the latter and rip out the insulation cable off electrical wires, it is not the best choice in this case. Lineman pliers are a perfect tool for gripping, pulling, bending and cutting electrical materials like wires and cables. They provide you with the needed safety, precision and efficiency to carry out their intended tasks. Therefore selecting the best tool available for electrical purposes is of great importance. The first thing you should consider when buying this type of pliers is the cutting life and power. A good pair of pliers should have edges with the longest cutting life and produce a small pinch on the tip snipped wire. Also, you need a high leverage pair of pliers that requires minimal effort when cut﻿﻿ting materials. Comfortable safety grips is also another thing to look out for in a lineman pliers. The best pliers will have cushioned grips that help prevent electrostatic discharge damage to sensitive electronics and components. Additionally, you need to buy materials with durable and sturdy materials. There are various materials for pliers. This include; alloy steel that is exceptionally durable, stainless steel that protects the pliers from rusting and contamination processes. You also need to consider the size of the pliers particularly the length. Extremely short pliers might end up injuring your hand when squeezing them. Therefore, go for a medium 6-inch lineman pliers to be assured of safety when on site. You can as well have a variety of sizes in your tool box for versatility. Go for top brands if you are looking for quality, durability and satisfaction guarantee. Moreover, well-known brands have reasonable warranties on their products as well as provide you with a wide array of options regarding sizes, models, and prices. When choosing the best pliers for the job, remember that there is no one size fits all. You need to get the best tool for your intended particular purpose. This is a compilation of reviews of five of the superior quality pliers for lineman’s jobs. The following products are all unique in their own way. Each pair of pliers come with unique features that you the readers at different levels. If you want to get the job done right, you will need the right tools for the job. And for electrical repair and maintenance, a proper lineman’s pliers is required. Klein has some of the most loved and preferred pliers within the electrical trade. Klein’s tools are made to withstand even the toughest working conditions. The comfortable grip and superior design make Klein’s pliers some of the bestselling hand tools in the market. There are many different types and styles of Klein’s pliers out there, but a good quality choice would be the Klein D213-9NE 9- inch lineman pliers. 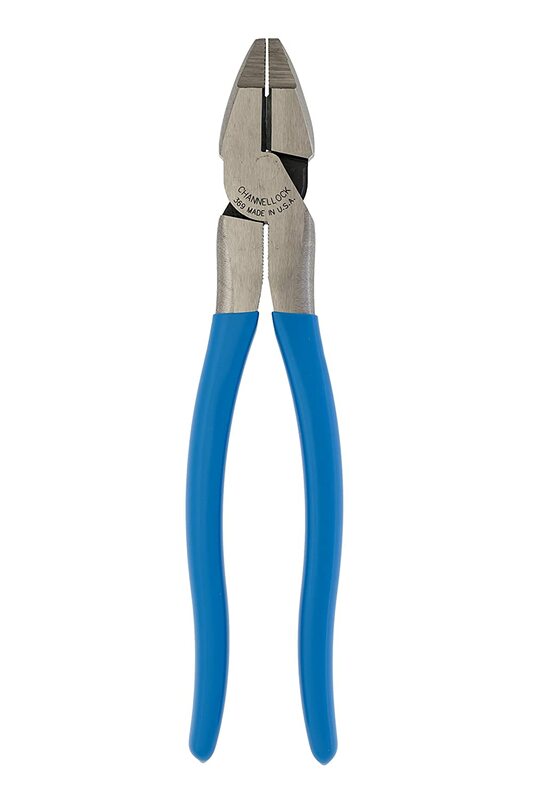 These are your go to pliers for cutting larger groups of wires, twisting wires together for good connections, and crimping. Excellent and comfortable grip – this Klein’s pair has a very comfortable grip. The plastic dipped handles give you a comfortable but firm hold of the pliers while allowing you to cut materials with ease. Also, the 9-inch length makes it long enough to enable you to squeeze the handles without hurting your fingers. High leverage – this helps you to cut materials easily and with minimal effort. Additionally, the pliers provide you with a high leverage even when gripping and cutting thick electrical materials. These set cuts with ease, precision and the tip of the cut are left clean. You might also find the pliers too tight on first use, but with time and with a little oiling you will find the ease of using them. Although highly priced, these set is pro quality. You can use them all day for electrical projects without any glitches. Once you get one of these, you will never look back when it comes to buying a top quality lineman pliers. If you have been in the market for pliers before, you will agree that Channellock is a brand that has come to be known as being one of the best manufacturers of pliers in the tools and home improvement industry. The brand produces a high quality assortment of pliers and that at very affordable prices. Compared to top brands like Klein, Channel lock pliers deliver the same quality and functionality but at a cost that is almost half of these top branded sets. Amongst the products in its 369 series, the Channel lock 369 9-1/2 –inch set is an excellent pick for those looking for pliers that can withstand all possible working conditions. Solid build and design – synonymous with Channel lock lineman pliers, this 9- ½-inch plier model is made with high carbon C 1080 steel that gives you superior and long lasting performance. The pliers also feature unique knife and anvil style cutting edge design for perfect mating and durable cutting life. Requires lesser cutting force – unlike most cutting pliers that need you to exert too much pressure when cutting, the Channel lock 369 9 – ½ - inch pliers gives you the exact opposite. The pliers utilize extreme leverage technology whereby the rivet is positioned closer to the cutting edge allowing you to cut cables and wires effortlessly. Provides precise and clean cuts – with precision machined knife and cutting edge alignment, this tool will cut through all types of wires whether hard or soft with utmost precision and ease. The pliers are relatively heavy due to the materials used in making them. This might be downsides for most users. Of all the products mentioned in this list, these IRWIN VISE- GRIP pliers have the best grip. Just like its name indicates, IRWIN put much emphasis on making good quality and comfortable grips for users in the electrical field. The pro touch hand grips and the machine jaws are the two most important notable features of these set. Superior build and design quality – these pliers from IRWIN are made with amazing quality than most pliers in its price range. They are made with high quality chromium steel, machined jaw, and pro touch grips all which provide you with high quality performance and durability. Maximum gripping – like I said, there isn’t any better pliers with the level of grips like this IRWIN set does. These pair grips both hard and soft materials giving a good angled cutting. 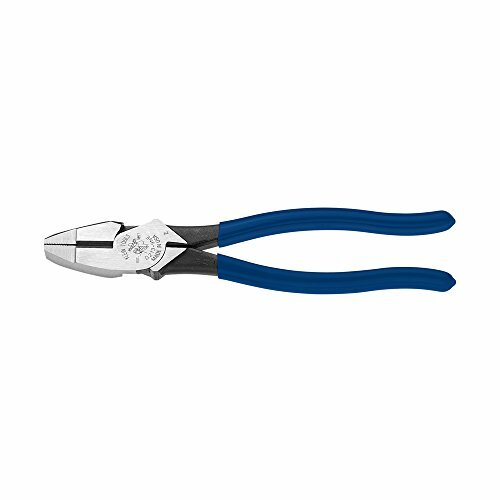 Additionally, the pliers feature beautifully, and quality designed blue pro touch grips that are not just comfortable in your hands but also reduce fatigue when working with them. Lifetime guarantee – talk of reputable brands, IRWIN is one of the brands that are confident in the quality of products they manufacture and supply. These pliers are a good example as they come with a lifetime guarantee for every purchase. This is so that you can also be assured of the quality and functionally of the tool. Long lasting sharpness – this is thanks to the induction hardened cutting edge that keeps the pliers sharp for a very long time. You can cut thousands of electrical wires and cables with this set, and they will still serve the same afterward. Although they are of good quality and price is great, you can get better quality pliers that can serve you better than this pair. These IRWINs are the perfect description of you get what you pay for. These fantastic and superbly built lineman pliers do a great job at bending, grasping and cutting hard wire as well soft ones. Interestingly, this set is the cheapest in this compilation as it retails at under $10. This price might seem ridiculous and make you doubt the quality of this tool, but once you get actually to use it, you will realize that it can do more than what the price indicates. Incredible cutting power and precision – this tool cut really well. You will be amazed at how easy it is to squeeze the handles and cut wires with this pliers by Stanley. Regardless of the size and thickness of wire you are cutting, its jaws and cutting edge will cut through both thick and thin wires as well as the hard and soft ones. The jaws are also hardened to give them long lasting sharpness. Comfortable and secure grip – the handles of these pliers are made with bi-material that is comfortable to hold and squeeze. It also features machined jaws that make them hold the materials very firmly. It doesn’t matter the thickness of the wire, the jaws of this tool can hold and cut even the thinnest of materials. Exceptionally durable and sturdy–apart from the bi-material handles, the body of this set is made with dropped forged steel for maximum durability and strength. What’s more is that the product meets ANSI specifications and therefore it is a valuable addition to adding to your toolkit and that at a fantastic price too. 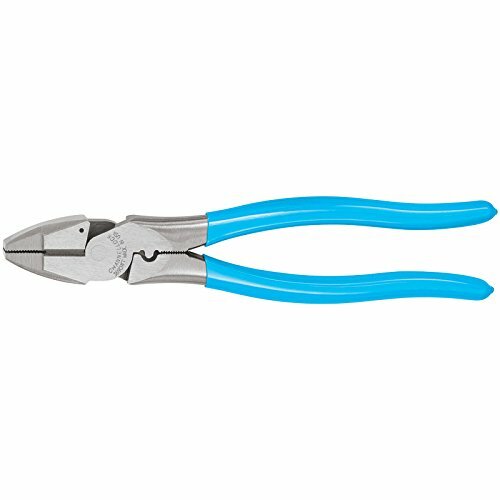 These pliers are an excellent choice for home improvement lovers who don’t work with a lot of thick wires. The sharpness and grips of this tool are good enough to cut household wires effortlessly. However, if you something more flexible and of better quality for commercial use, then this is not the best tool for you. 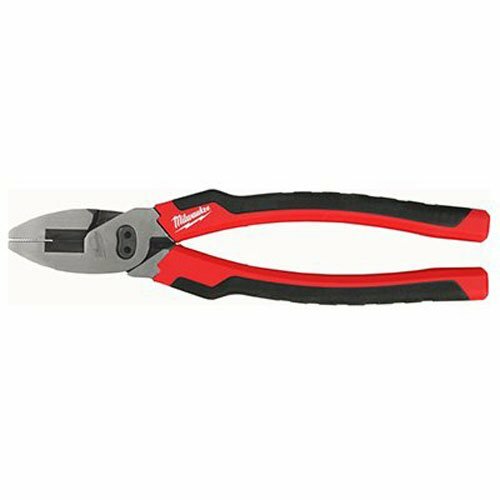 This Milwaukee 48-22-3309 6 in 1 lineman pliers managed to get in our top 5 list majorly because of its integrated ream head and high leverage design. The pliers are best suited for both commercial and domestic electrical needs as they are of good quality, easy to use and has some amazing features for the job too. Unique design – like the manufactures claim, these Milwaukee pliers are the only tool of its kind with an integrated reaming head. This reaming head helps to smooth out rough edges of metal pipe. High cutting leverage–using this set of Milwaukee pliers gives you an amazing cutting leverage. It has superior cutting power and precision even for cutting thick electrical materials. The best thing about this is that it needs very little effort to squeeze the handle to make a cut. Versatile 6 in pack – for a home improvement enthusiast or a professional electrician, this Milwaukee product is a good buy. With a single purchase you get an improved 6 in 1 specific designs for various applications. If you are a professional lineman or just a do it yourself lover used to carrying a lot of tools to the job this pack will reduce your baggage to a more light and more versatile toolkit. Durably built – the body of this pliers is made with hard alloy steel that is known to be extremely durable while the handles are made of soft quality rubber with a series of ribbed surfaces for better cushioning and slip resistance. What’s more is the rust prevention coating on the head for protection against rust and prolonging its aesthetic value. These pliers are quite bulky and heavy. Milwaukee electrical hand tools like this lineman pliers have shown that the brand has since improved on quality and efficiency. Therefore, if you want a go to brand of lineman pliers within the same price range as the IRWIN model but with better quality and functionality then this is it. In this era where technology rules over everything, it is extremely difficult to stay without electricity. It has become a necessary utility for most civilized nations and hence the growing need for skills and tools to solve associated electrical problems. A lineman pliers is one of the tools used to identify and repair problems in electronic components like wires and cables. And since this job is hazardous, handlers are advised to observe and maintain all safety precautions every time they are on site. You need protective gear like gloves, goggles, matting and apron to protect your eyes, hands, legs and body form dangers of electricity like sparks and electrical shock. Keep your tools close to you. You can get a belt that is most common in linemen and keep your pliers in there for easy access. This is recommended if you will be climbing to make these fixes. If you intend to climb poles, use pole climbers to help balance your weight as you climb up the pole. Do not jump into repair before testing out the problem first. There are equipment for testing so make sure that you have one of these and use them to locate faults. After you locate the fault, use your lineman pliers to correct the problems. Choosing the best quality pliers is not easy. But once you get the right guidelines and follow them diligently then you can be able to buy an ideal tool for your electrical needs. Keep in mind that a good quality set of tools can last a very long time and equally help you to achieve better results both in quality and efficiency just like professionals do.